Today I'm sharing some more of the picture books I've been reading for the Picture Book Reading Challenge checklist at Becky's Book Reviews. These books fulfill #19 a book translated into English (Little Locomotive), #43 a book published before 1950 (Flicka, Ricka, and Dicka and the New Dotted Dresses), #95 a book about another country (Shawneen and the Gander) and #98 a bilingual book (There Is a Dragon in My Bed and Other Useful Phrases in French and English). 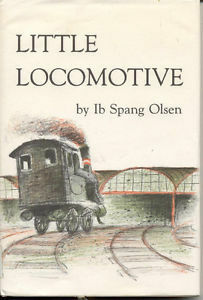 Little Locomotive is one of many used vintage books sitting on the shelves at my house. I picked it up at random when I was looking for picture books to read for this challenge, and I definitely made a good choice. The little locomotive is a runaway train whose adventure takes him right into the kitchen at Mrs. Jensen's house, where he snatches up her laundry and makes off with it. The plot is a bit over-the-top in its silliness, but the language is really enjoyable. "Dagadum" - the sound the little locomotive makes as he travels along the rails - is a perfect onomatopoetic expression of what trains sound like to kids. There is also a wonderful rhyming interlude in the midst of the story where the text lists the many things the locomotive passes as he picks up speed. The rhyming is especially impressive because the book was originally published in the author's native Danish. 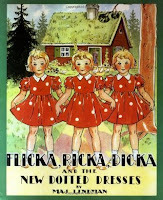 I have a very vague memory from my early childhood of visiting the public library in my hometown and borrowing some of the books in the Flicka, Ricka, and Dicka series. I have no idea whether this title was one of the ones I borrowed back then or not, but it still gave me a faint sense of nostalgia as I was reading. The text is very straightforward, with simple sentence structures and more telling than showing. Because of the simplicity of the writing, I kept thinking that this book could easily serve the same purpose as an easy reader. I like that the three girls are portrayed as independent, resourceful, and helpful, and that they unselfishly drop everything to help an old woman simply because they have been taught to make themselves useful. 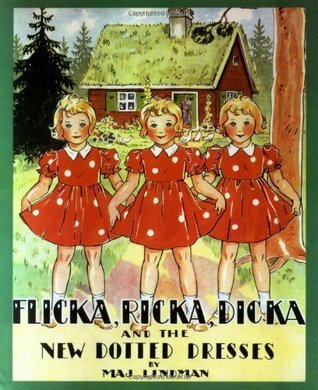 I also appreciated that, unlike the kittens who soil their mittens in the nursery rhyme, the girls are not punished for dirtying their dresses. Their mother is not pleased by the situation, but instead of getting angry, she and the girls simply work together to mend the dresses and get on with their lives. I think Miss Muffet would enjoy this series - I'll have to give them a try sometime soon. Shawneen and the Gander is a tale set in Ireland, so naturally it involves a leprechaun. Shawneen longs to have the bugle that is available for sale at the local shop, but he just can't afford it. 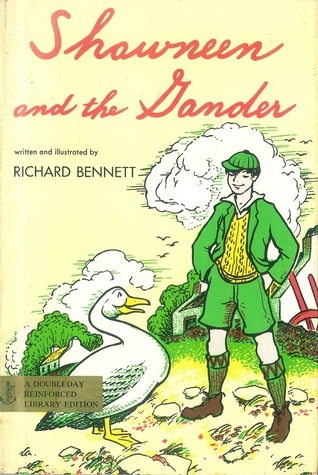 A leprechaun gives Shawneen an egg and tells him to hatch it and sell the gander, and then he'll be able to buy the bugle. But the gander proves to be more difficult to part with than Shawneen ever imagined, and the path to finally owning that bugle has some surprises along the way. Despite being half Irish, I don't really enjoy leprechaun stories that much. I think the same part of me that struggles to appreciate fantasy also just doesn't really understand the appeal of leprechauns' mischievous magic. This book was fine, and I liked the artwork, but it just didn't make a special impression on me at all. This imaginative phrasebook is similar in tone and sense of humor to Joslin's What Do You Say, Dear? illustrated by Maurice Sendak. The entire thing is very tongue-in-cheek. Each page shows a phrase in French, along with its English translation and an accompanying humorous illustration of a situation in which the phrase might come in handy. This book would be really fun for a confident elementary reader who could sound out the phonetic pronunciations for the French phrases. It would also be a wonderful book to give to a child who speaks both French and English, or who is learning French. I am excited for the fun my own kids will have with it when they are older! 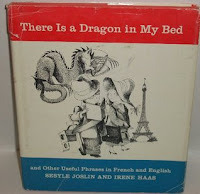 There is a Dragon in my Bed looks so wonderful, I love little books like this for people who are trying to learn a language. Here's to hoping someone has a copy in Spanish, haha.